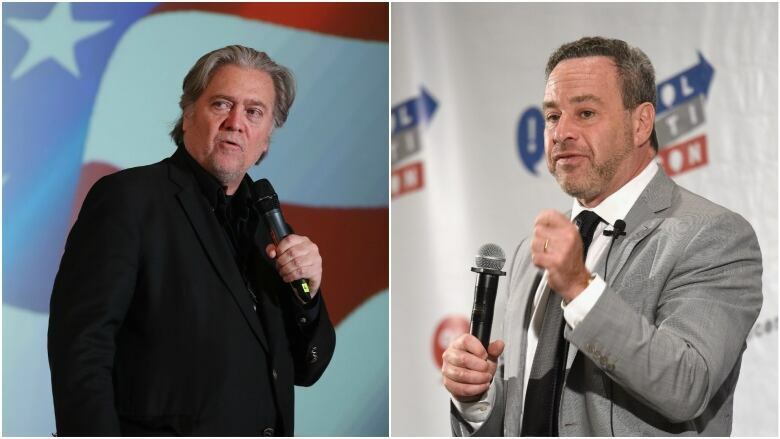 "Banning Bannon is good for democracy"
It was atop a double byline op-ed that argued Steve Bannon should not be allowed to debate writer and renegade Republican David Frum at a Munk Debate in Toronto next week. The resolution: "The future of western politics is populist not liberal." Sounds tame enough, but the authors of the op-ed argue that if Bannon is given any kind of public forum, Canada is risking its Charter of Rights and Freedoms, threatens what they call "our sense of belongingness in society, and undermines the mutual trust on which the sharing of public space rests." That's an awful lot of social damage to be caused by the mutterings of a lone, right-wing American gas bag. They wind up the piece by declaring that Bannon has no respect for liberal democracy. Which misses the entire point. I don't care if Bannon has no respect for democracy, but I do care if Canadians do. "Banning Bannon is good for democracy" is so Orwellian in concept, I wonder if the duo was paraphrasing him. "War is peace, freedom is slavery and ignorance is strength." They certainly weren't channelling the George Orwell who said; "If liberty means anything at all, it means the right to tell people what they do not want to hear." Orwell, thou shouldst be living at this hour. We don't handle dissent very well in this country. We tend to cluster around the conventional, the familiar, those things that reinforce our own opinions or are rhetorically harmless. We prefer the status quo to be status. To many Americans and Canadians, Steve Bannon is a glib, well-dressed fascist, the Dr. Frankenstein who gave the world Donald J. Trump. He may well be that and more, but he does represent a school of thought, a vigorous and dangerous mindset that, if left to grow in darkness like mushrooms, could prove to be liberalism's undoing. Lewis Lapham, essayist and fabled editor of Harper's wrote in his short book Gag Rule: "We can't know what we're about or whether we are telling ourselves too many lies, unless we see and hear one another think out loud." Bannon has to be confronted and the only way to do that is to hear the man and parse his language, his attitudes, his grotty enthusiasms. As documentary maker Michael Moore put it: "We want to hear him speak. You always want to hear the devil speak. You always want the devil to tell you his plans." The Munk debate has to go forward not just as a symbol of our ability to tolerate words and thoughts we despise, but as an important piece of political intelligence for all the world to see. David Frum has been on this program many times over the years. He's five times as smart as Bannon and ten times as articulate. He will hand Mr. Bannon his head.